Identification: Tiny. Upperside of male dark dusky blue on basal half, outer portions black; female is black with a brown cast. Underside white with large spots on forewing, small spots on hindwing. Wing Span: 3/4 - 1 inch (1.9 - 2.5 cm). Life History: Probably very similar to that of the Small Dotted-blue. Flight: One flight from mid-June to early July. Caterpillar host: Eriogonum spergulinum in the buckwheat family (Polygonaceae). Adult Food: Flower nectar, observed to be from flowers of Epilobium. Habitat: Ash fields with low scrubby vegetation and open areas of ash. Conservation: All populations should be conserved and monitored. Management Needs: Determine effects of exotic plants and fire on extant populations. Reference: Hammond, Paul C. and David V. McCorkle. 2000. 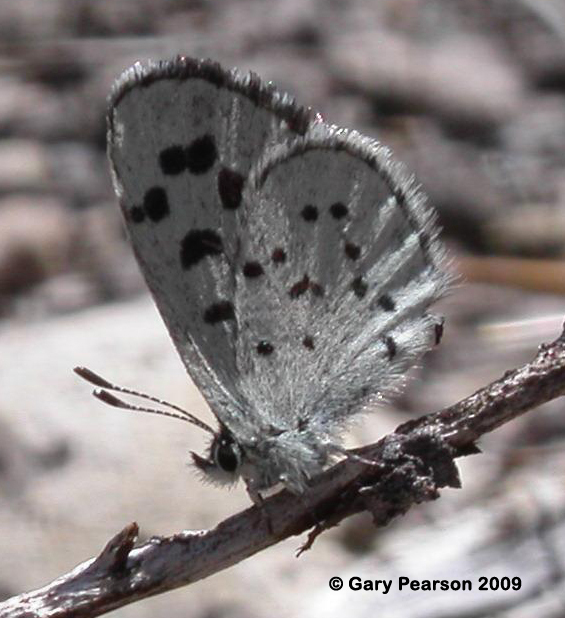 A new species of Philotiella from the Oregon Cascade Range (Lepidoptera: Lycaenidae).Holarctic Lepidoptera 6(2): 77-82.